Myths and urban legends flourish in an array of settings—business, sports, storytelling, and even healthcare. They may not all be as famous or as colorful as the legends of Sasquatch and the Loch Ness Monster, but myths even abound as part of the change from ICD-9 to ICD-10 coding, scaring off providers and others from taking the plunge to transition. With the ICD-10 deadline in a state of limbo, hospital leaders are wise to stay the course on this major initiative. Myth 1: Coders and physicians will have to learn thousands of new codes. The diseases aren’t changing. The codes on how to report them are changing to become more specific and dependable. Users won’t necessarily have to learn more new codes, but they will have to change ingrained habits on how to access more powerful and specific codes. Coders will need to beef up their knowledge of anatomy and physiology, and physicians will be required to shore up clinical documentation with more specific nomenclature in documentation that translates to effective coding. Vague descriptions of conditions by physicians and rote memorization by coders—or guessing what they think the correct code is—will no longer suffice with ICD-10. Training for staff—as much as 50 hours—is critical and cannot be overstated. Myth 2: ICD-10 and EHR implementation are competing initiatives. Some healthcare professionals are avoiding the task of transitioning from ICD-9 to ICD-10 because they are confused about priorities and feel caught between competing initiatives. But implementing EHRs, attesting to meaningful use, and transitioning to ICD-10 are closely aligned and complement each other. These initiatives together should be considered as a comprehensive package to improve documentation efforts. 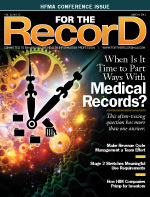 A speedy, efficient EHR can ease the ICD-10 implementation. EHRs may streamline the coding process by functioning as coding crib sheets, providing boundaries and helping providers select the most appropriate code. Transitioning to ICD-10 ensures that EHRs, value-based reimbursement, and meaningful use incentive programs all speak the same language. Myth 3: ICD-10 has no benefits for stakeholders. On the contrary, everyone wins with ICD-10—from providers to patients. As mentioned, the specificity of ICD-10 is its forte. Because it facilitates more accurate diagnoses, ICD-10 enhances patient outcomes, supplements evidence-based research, and improves public health tracking and population health analysis. As providers become more accountable for patient outcomes, less ambiguous coding will help specify reasons for patient noncompliance. Enhanced documentation of a patient’s condition will improve shared data with health information exchanges, facilitate auditing efforts, and decrease fraud and abuse. The ability to leverage ICD-10’s greater granularity will help increase reimbursement and establish more effective processes. Myth 4: The time is not right for the transition to ICD-10. The time is not only right to transition to ICD-10, it’s long overdue. ICD-9 was created in 1979—before the identification of many diagnostic and technological developments that have occurred in the past 30 years. The United States needs coding that matches recent medical discoveries and aligns with other developed countries that adopted ICD-10 years ago. Even though the Centers for Medicare & Medicaid Services are shifting the schedule, the time is right to switch to ICD-10. Those contemplating waiting and leapfrogging directly to ICD-11 once it’s ready should reconsider. ICD-10 is the pathway to ICD-11, and any planning done now for ICD-10 will not go to waste. Discerning fact from fiction will only put providers in a stronger position to gain clinical and administrative efficiencies and enhance revenue. — Stuart Newsome, CHCC, vice president of business development at Unicor Medical Inc. in Montgomery, Alabama, has spent 16 years in medical coding.